Molecular Approach to Cancer Management discusses molecular mechanisms of cancer initiation, growth and secondary spread, emphasizing how this information can be used to devise new modes of treatment of cancer, especially in combatting secondary spread. 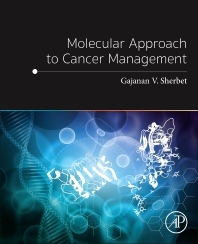 The book addresses the basic concepts relating to cancer biology, the genetic determinants, and the signal transduction cascades associated with tumor growth, EMT, stem cell maintenance and propagation, and invasion and metastasis. The salient features of the signaling systems that are amenable to targeted manipulation are emphasized to facilitate research and development in the design of novel therapies and for the planning of new trials. This book is the only unique volume with coverage of topics that target therapy. As such, it is a valuable source for cancer researchers, molecular oncologists and members of the biomedical field who are interested in knowing more about molecular approaches to cancer therapy. 14. Are there gains to be made in exploring anthrax lethal toxin (LeTx) as a tumor and an angiogenesis inhibitor? Dr. Gajanan V. Sherbet is Doctor of Science of London University and Fellow of the Royal College of Pathologists and the Royal Society of Chemistry. He is member of the editorial boards of many scientific and medical journals, and formerly editor of Experimental Cell Biology and Pathobiology. Dr. Sherbet’s major scientific interest is in cancer metastasis. He has focused on the role of growth factors and their signaling, and the calcium binding protein S100A4 in cell proliferation, cancer invasion and metastasis; also he is currently studying the potential of artificial neural networks for predicting breast cancer progression and prognosis. Dr. Sherbet has numerous scientific papers in international journals and has written and edited several books on cancer, such as Growth Factors and Their Receptors in Cell Differentiation, Cancer and Cancer Therapy (2011) and Therapeutic Strategies in Cancer Biology and Pathology (2013), and e-books on the role of growth factors and their receptors in cancer therapy and therapeutic strategies in cancer biology and molecular pathology.